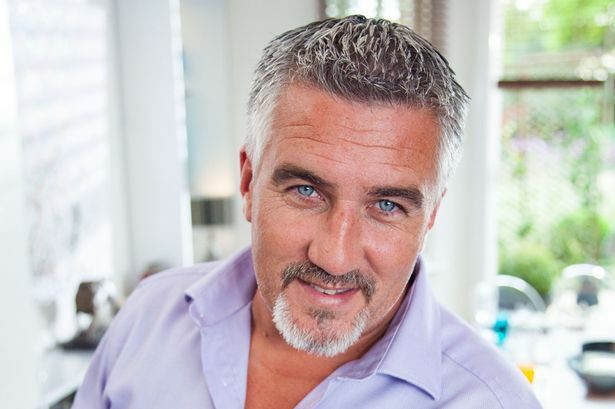 Have you caught the Great British Bake Off fever? It’s only the past couple of years that I’ve got into Bake Off but now it’s a must-watch show in our household. The excitement, the stress, the ups, the downs, the double-entendres, and of course Paul’s beautiful eyes! Last year I really caught the Bake Off bug, rooting for Nadia the whole way! This year I’ve been inspired by Mummy Mishaps Great Blogger Bake Off blogging challenge to get a bit more involved. Although I love to cook I very rarely bake, so I’ve decided to try all the technical challenges in an attempt to improve my baking skills & knowledge. 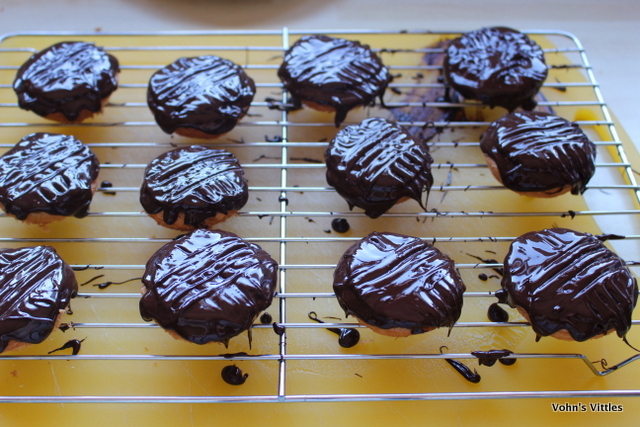 First up, week one – jaffa cakes using Mary’s recipe. 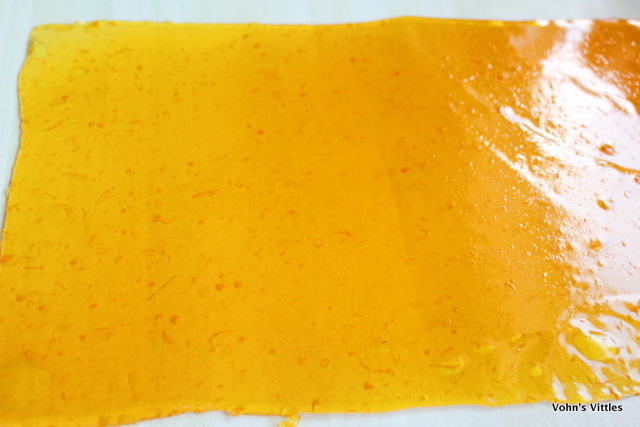 The first stage is to make the jelly. 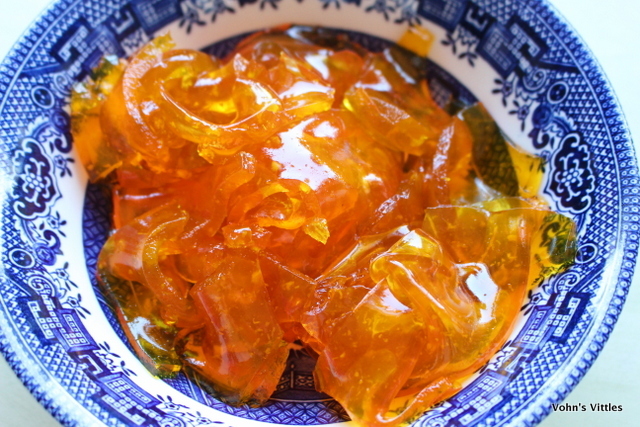 Mary’s recipe is for one standard 135g packet of jelly, made up using only 5fl oz of water, so it is firmer set than a usual jelly, and to add the grated zest of one small orange. I remembered that bake-off contestant Candice went off-recipe (very brave for a technical challenge) and also added the juice of the orange – it worked because Paul commented that it had great flavour. So, to maximise the orange flavour I went for a large orange and used the zest & juice. Of course, you must measure out the amount of juice and reduce the amount of water by the same amount, otherwise the jelly will not be set firmly enough to cut into discs. As someone who tries to eat as cleanly as possible and who has eliminated most processed food from her diet, I was horrified to read the ingredients in a standard packet of jelly. 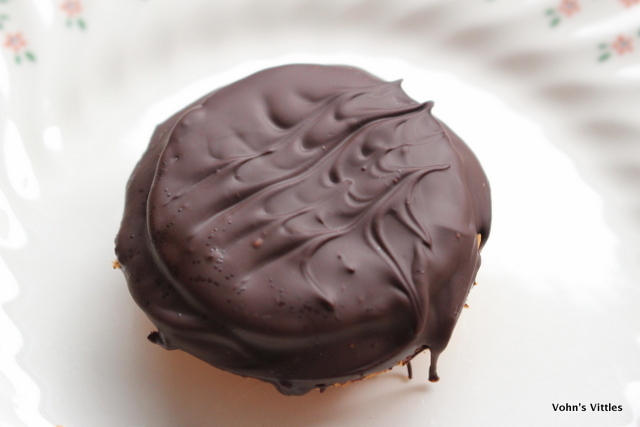 However the challenge had been laid down by Mr Vohn to make jaffa cakes, so I went ahead. If I make these again, I’ll be making my own jelly from scratch! 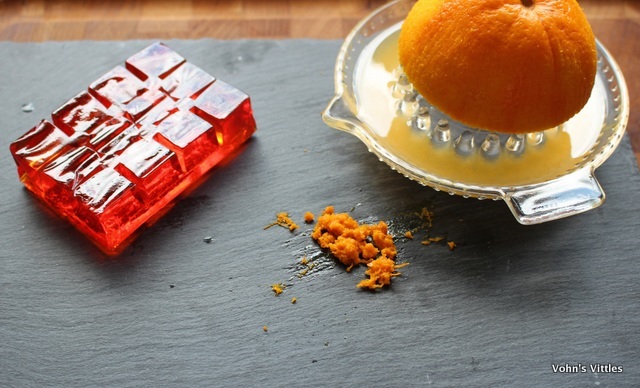 The jelly gets poured into a baking tray and put in the fridge to set in an even layer. Next stage is to make the sponge. First up grease a 12-hole bun tin with butter. 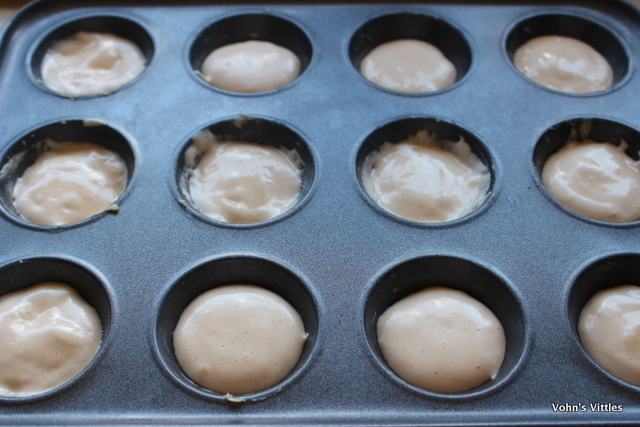 This step is absolutely crucial and in fact Ruby Tandoh (a previous year’s GBBO finalist) makes little circles of greaseproof to put in the bun tray before the mixture goes in – I’m sure it works but it’s way too fiddly & time-consuming in my opinion! 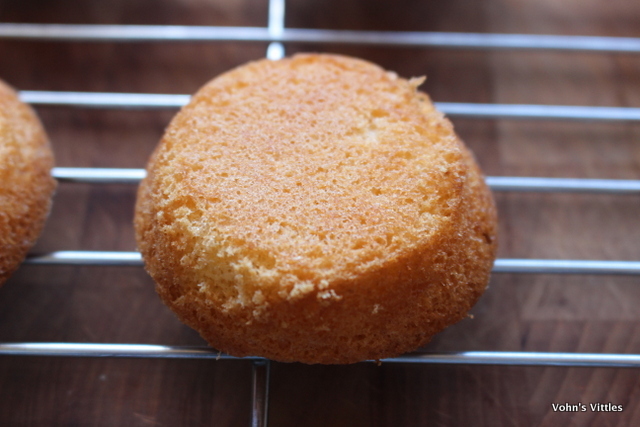 The sponge is a fatless one and I don’t think I’ve ever made such a thing before! Now that I have, I will be doing so again – it is lush! Mary advises that there is such a little amount of mixture that it is best to use an electric hand whisk, rather than a stand mixer. However I know my Kenwood is great at getting to the bottom of the bowl, so I go ahead and use that & it works fine. If you know that your beater doesn’t reach right to the bottom of your mixing bowl, then definitely use the hand whisk method. 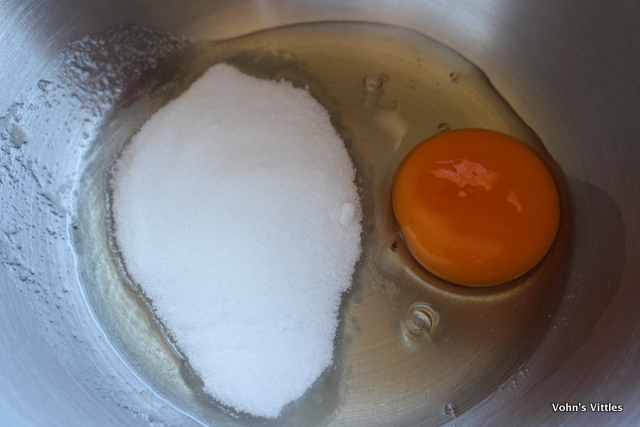 Start by beating 1oz sugar and 1 egg together for 4-5 minutes until pale and fluffy. 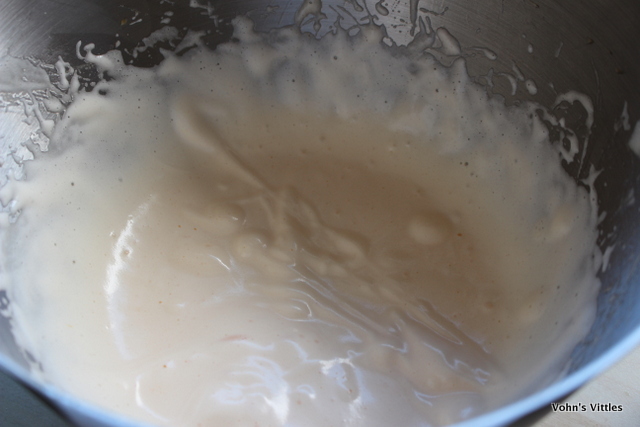 You’ll know its beaten enough when a ribbon of the mixture will sit on the surface and not disappear. Next sieve in 1 oz of self-raising flour & fold in gently. 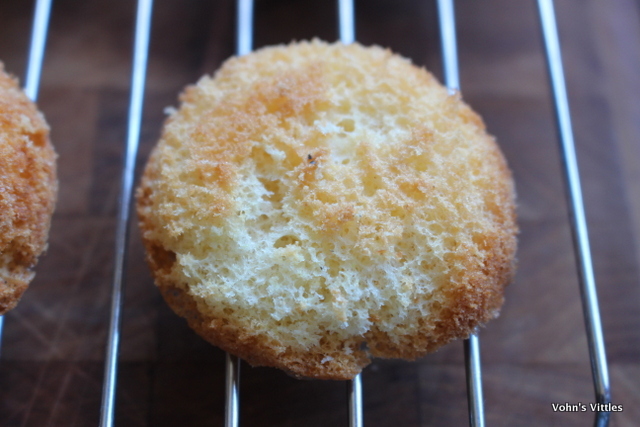 I never keep self-raising flour so I used plain flour & 1/2 tsp baking powder. Mary says to then fill each well in the bun tin three-quarters full. 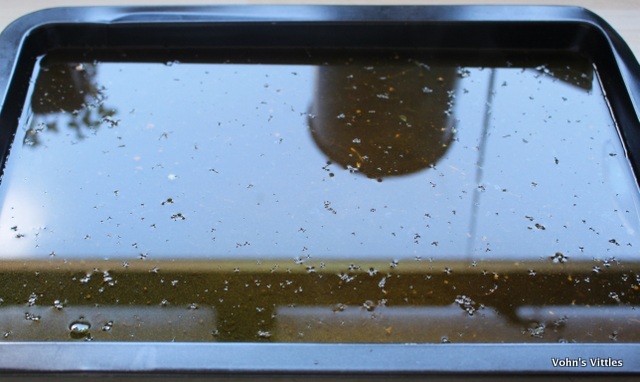 However I didn’t have enough mix to do this and had to go back and steal mix from some of the wells to complete the tray. You can see the mess in some of the wells in this picture were I’ve had to do this. I worry the messy ones will be difficult to turn out when cooked and might stick. They did! 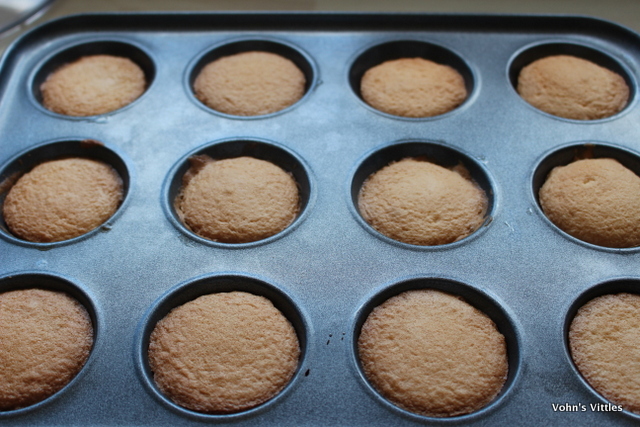 They look lovely once baked at 180ºC for 9 minutes. 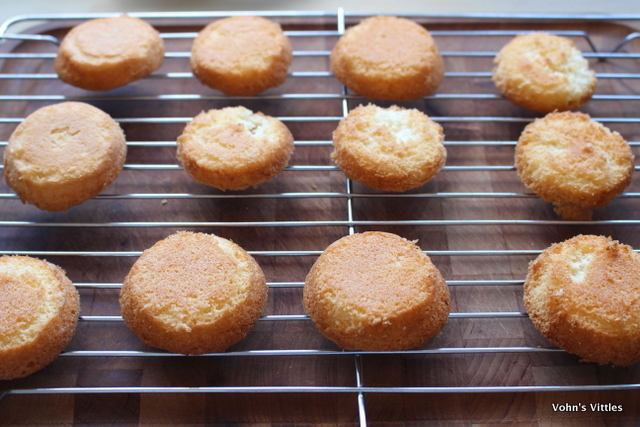 I left them to cool in the tray for a few minutes and then turned out onto a cooling rack. I did need to run a knife around the edges but then they popped out quite nicely. The others would have been severely criticised by Paul! Sponge FAIL! So my top tip for making jaffa cakes is that buttering your bun tray and spooning the raw mixture in is actually the most crucial stage of this recipe. Previous bake-off contestant Ruby Tandoh even goes so far as to make little circles of greaseproof paper for the bottom of each well, which seems like way to much time and effort to me – but if you are having continual sponge disasters, maybe give that a try. If I make them again I will spoon one teaspoonful of mixture into each well and then top-up with any remaining mixture. The next stage is to melt the chocolate, so it has time to cool slightly before use. 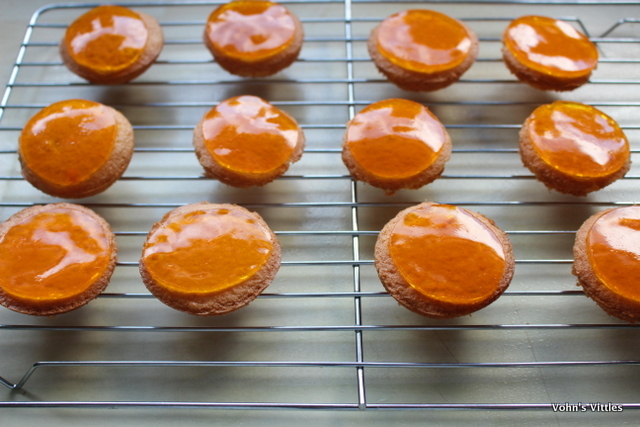 Then turn out the jelly and cut discs for the top of each jaffa cake. I didn’t have the 4.5cm round biscuit cutter that Mary advises you use, so I just used a drinking glass with a similar diameter. With all 12 sponges topped I have a considerable amount of jelly left over. I reckon about half of it. I abhor food waste and pop it in a bowl in the fridge. However, due to previously mentioned elimination of processed foods from our diet, no-one really fancies it and I throw it in the bin several days later. What a waste! So, if making this recipe again, I would half the jelly or even better – make double the sponge mix to make twice as many jaffa cakes. The next stage is to cover the tops with chocolate. My first one was a complete fail, as the chocolate was obviously still too hot. The jelly started to melt and the chocolate slid off the top. 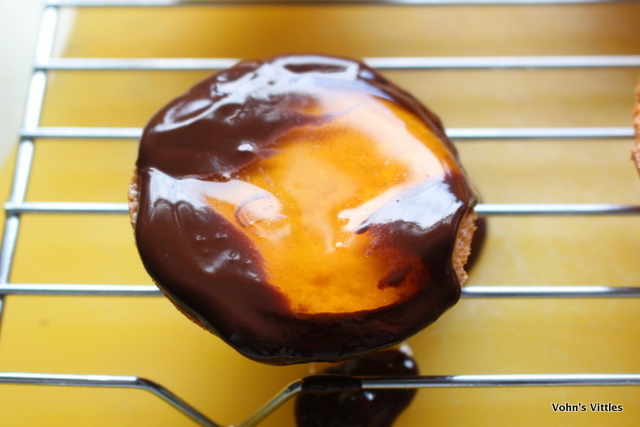 Jaffa cake FAIL! I can only imagine the stress I would have felt if I’d been in the bake-off tent when this happened! Luckily I have no plans of ever being a contestant! I let the chocolate cool a bit more and tried again. 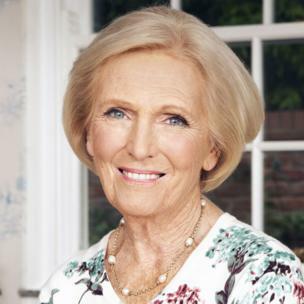 Mary says in the recipe intro that “the only fiddly bit of the recipe is making the chocolate look perfect – but they’re still great if you just spoon it over”. However the recipe instruction simply states “spoon the melted chocolate over the jelly discs”. When I do this I end up with great blobs of chocolate dripping off the sides – I try to smarten then up by running a knife round the edge but with only limited success. I’ve tried asking Mary & Paul on social media how the chocolate work can be done without this mess – but no reply to this lowly blogger! I remember bake-off contestant Selasi was the only one to pipe the chocolate on using a piping bag. He won this technical challenge, so perhaps piping is the way to go. I’ll try this if I make them again! Look at the perfect edges in the photo which accompanies Mary’s recipe! Most of the contestants seemed to struggle with the criss-cross pattern on the top but Mary’s instructions to lightly press using the tips of the tines of a fork are straightforward and I am fairly happy with the result. The chocolate could probably be a bit shinier, so I resolve to get out my sugar thermometer if I make these again, to ensure the tempering process is spot on! Of course, the point of any bake is that is is tasty and enjoyable to eat. These were, oh my delicious! The sponge is as light as a feather, the jelly is full of flavour and the chocolate is think and crunchy. 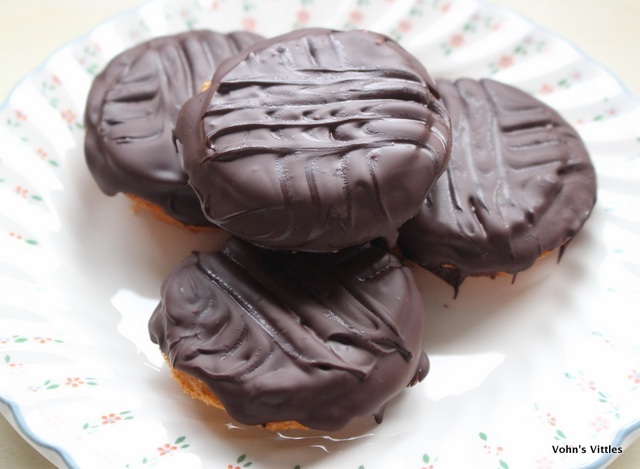 They are similar to McVities jaffa cakes but with much more depth of flavour and much lighter. I restrict myself to one at a time but it’d be very easy to polish these off in one go! – Pipe the chocolate on top, instead of spooning. I’m really glad I made them and I certainly learnt some baking skills & tips for the future, which was the whole point of the exercise for me. I will definitely make them again and, being a recipe developer, I will definitely play around with the recipe a bit. I am thinking black cherry jaffa cakes! Would they still be called “jaffa” cakes though?? Glad you managed to find it on YouTube Mafaza – it’s a great watch. 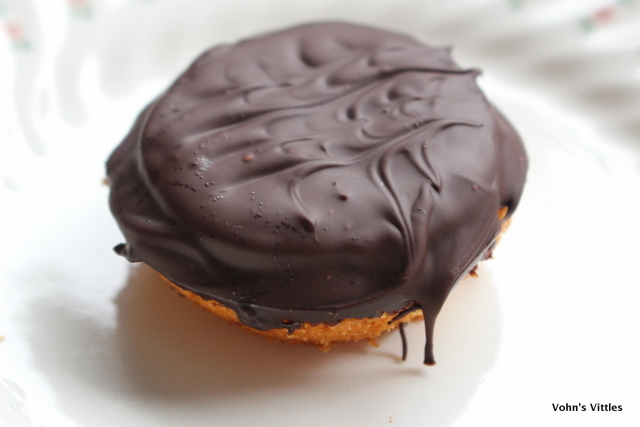 Jaffa Cakes are kind of an institution in Britain. With so many British ex-pats in Dubai, you may well find them to try. That looks delicious! And I’m not usually a chocolate and orange fan but I’d happily devour these. Welcome back Vohn! 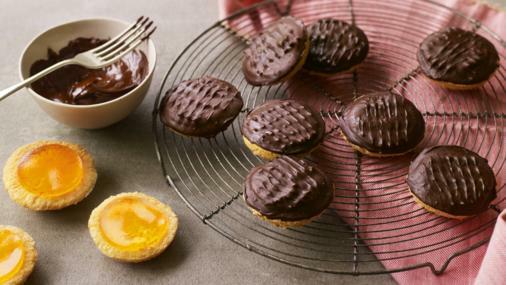 well having seen your version of Mary’s jaffa cake recipe and several others who have tried it for the bake along, the adding of the chocolate does appear to be their downfall too. therefore, it would make me think that Mary’s photo has either been photo shopped or someone was paid to get that right after a lot of practice! Thanks Jenny & thanks for arranging #GBBOBloggers2016 – I’m a big fan of blog challenges as it’s a great way to keep your skills fresh and up-to-date. I definitely need more practice to achieve chocolate perfection. I too thought that the ones in Mary’s photo had been done by someone with lots of practice – perhaps it was naive of me to think that person was Mary herself! I hadn’t even considered the photoshopping possibility – how naughty of them!